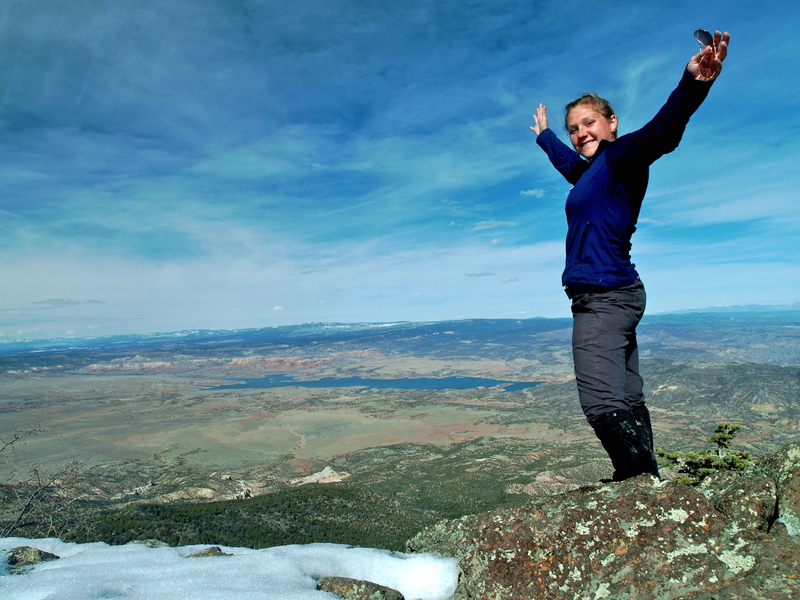 Me on the summit of the Pedernal on my 27th Birthday- 9,862 feet! Every year for the past five years, I have climbed a mountain on my birthday: 25th- Mary’s Peak in Oregon, 26th- Dragon’s Tooth in Virginia, 27th- the Pedernal in New Mexico, 28th- Grand Central Mountain in New Mexico, 29th- Mount Megunticook in Maine. Since my birthday is in the winter, I don’t usually go for height. The idea is simply to climb up to somewhere rare and sit for awhile, with the world at my feet. 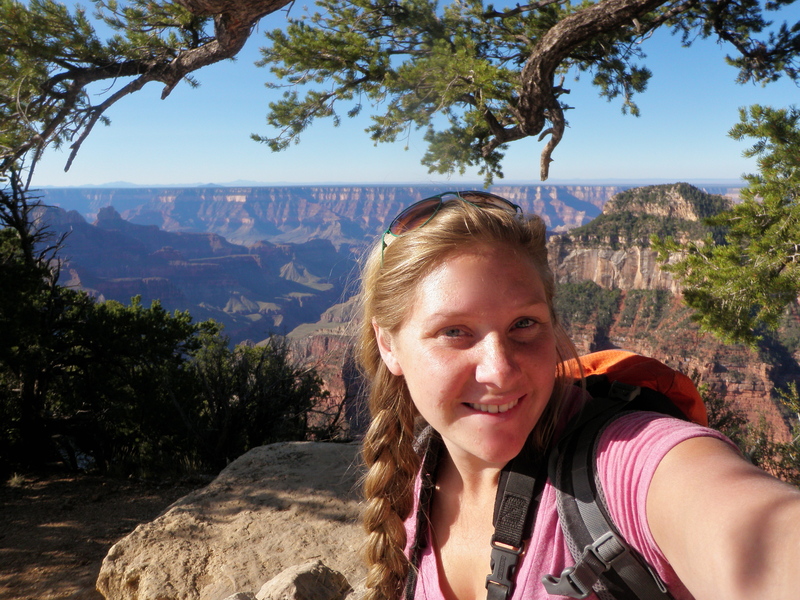 This year, for my 30th, I decided to go a little grander: a backpacking trip through the Grand Canyon! The Grand Canyon is kind of like a reverse mountain, with more than 5,000 feet of elevation separating the rim and the river. I’ve been to the North Rim and the East Rim twice and the South Rim once on different road trips, but I have yet to hike down into the canyon. 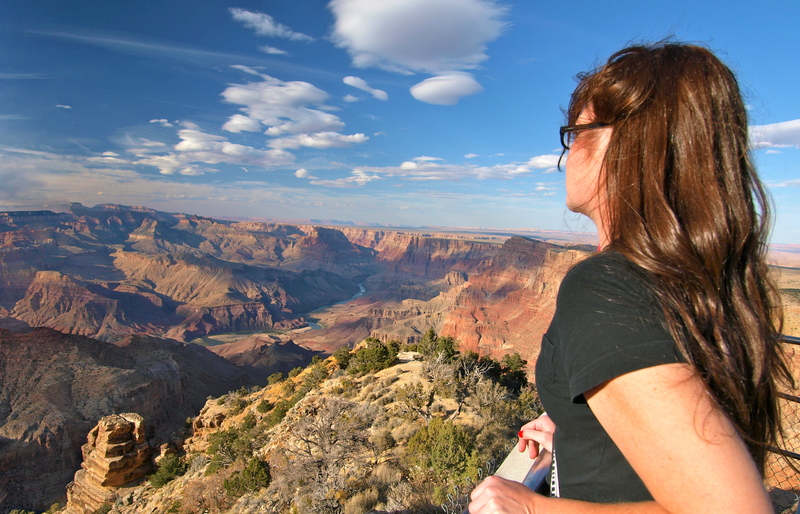 To hike in the Grand Canyon, you are required to get a Backcountry Permit from the Backcountry Information Center. Permits help rangers keep track of how many people are in the canyon, where they are going and when they’re supposed to emerge, information that helps manage canyon traffic and aids in search and rescue operations. Permits for the peak hiking seasons, spring and fall, often run out months in advance. February is statistically the quietest month in the canyon, but since I knew when I wanted to go, I went ahead and applied for my permits back in November. To get a permit, I had to tell them where we’d be entering and exiting and where we’d be camping each night so I needed to figure out our route. The North Rim of the canyon is closed in winter due to snow, so I knew we’d have to hike from the South Rim. I wanted to do a loop, entering and exiting the canyon at different access points and I wanted to hike for 3 to 5 days. When planning a backpacking trip, I usually aim to average about 10 miles a day, depending on the length of the trip, hiking abilities and terrain. The Grand Canyon is a beast and February days are short, so I decided on an average of 5 to 7 miles a day, which would allow for plenty of gawking and exploring along the way. The Grand Canyon is a huge place, broken up into four management zones: corridor, threshold, primitive, and wild. 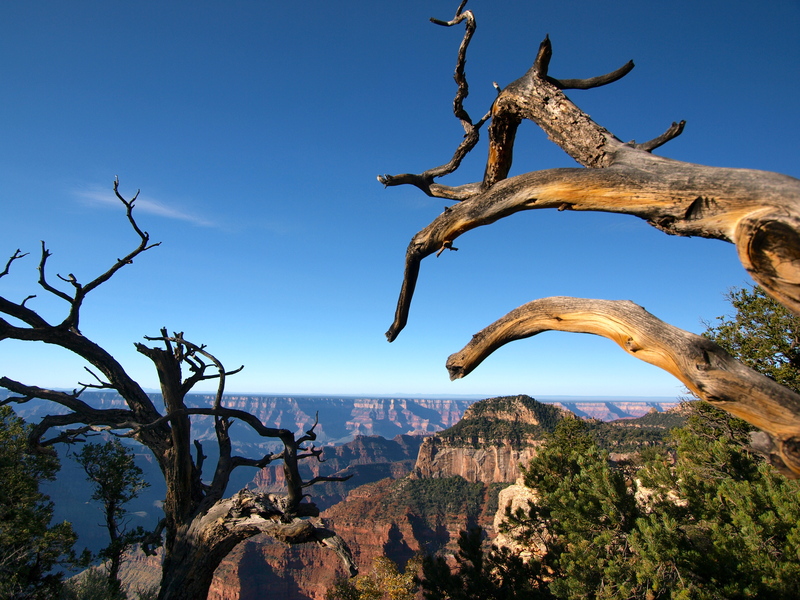 The corridor is the most commonly traveled region of the canyon, including Bright Angel, Indian Gardens, and the Kaibab Trail. Trails become progressively more remote and less maintained as you pass through the threshold into the primitive and wild zones of the canyon. I am an experienced backpacker but since this will be my first time hiking in the Grand Canyon, I elected to stay within the corridor and threshold zones. Besides, it’s winter, and I’m not too worried about hitting trail traffic. Given all those parameters, our route became obvious: the Tonto Trail between Hermit’s Rest and Bright Angel, a 25-mile trip. The Winter Hiking page on the Grand Canyon National Park website noted that Hermit’s Rest is southwest facing and generally has less snow and ice than most other trails, so I decided that’s where we’d descend into the canyon. Bright Angel can be icy, but I’d rather deal with ice going uphill than downhill. Uphill is tiring but downhill is dangerous. See that trail down below? I'll be on it next week! Once I picked our route, it was just a matter of sitting down with a topo map (I like the National Geographic Trails Illustrated maps) and picking campsites spaced the right distances apart. In the corridor and threshold zones camping is only allowed at designated campsites, which are scattered throughout the canyon. The Hermit’s Rest and Tonto trails are in the threshold zone and then we come into the corridor to climb out on Bright Angel. Our longest 9-mile day is the first day, followed by a short day two that will allow for a side trip to the Colorado River on my actual birthday. Then we head up canyon for two more 5-mile days, leaving the final 5-mile climb out from Indian Gardens for day 5. My permits came in the mail just a few days after I faxed the printable form to the Backcountry Information Center: 2 people, 5 days, 4 nights, Hermit’s Rest to Bright Angel via the Tonto Trail. Happy Birthday to me! 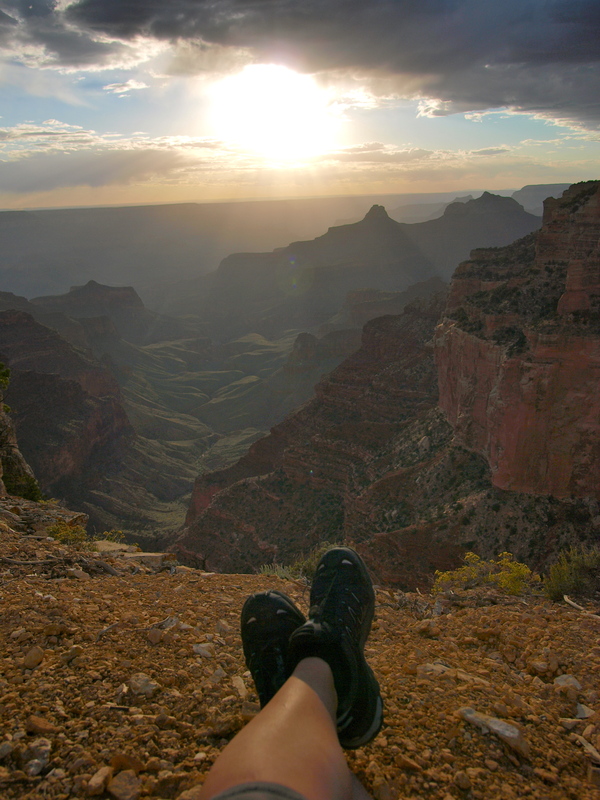 This entry was posted in Hiking!, Photography, Road tripping!, Uncategorized, Vagabonding 101 and tagged backpacking, grand canyon, winter. Bookmark the permalink. I just found you on freshly pressed, and know that I will enjoy reading of your travels. I love your blog. I am also a blogger and I am just starting to understand how to post pictures. I have dogs also; all rescues with sad stories. Your dogs are so lucky to get out without restraints. I hope you continue to blog so that all of us who are a little older can live vicariously through your escapades. Much love to you….Deborah (Coty) Moore (That is my pen name.) I am a retired lawyer. Your shot of the sunset with the feet is awesome, but all of your pictures are always great! I have been considering taking my daughter there, but we can’t decide whether to hike or to raft or to do some of both. Thanks for all the tips! Yeah, a rafting trip would be pretty tempting too, though I’m more of a float trip person than a white water person. I’m not very brave about water! Maybe it depends on the time of year that you go. I imagine rafting would be a better option than hiking in the hot summer months. A delightful blog and love the pictures. What a wonderful blog and what a fantastic thing to do for your birthday. I am in awe of your intrepidness and bravery! !